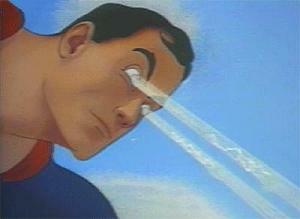 How would you like to use the power of Superman’s X-Ray Vision when searching LinkedIn? By using the Google Search X-Ray techniques outlined below, you can! With a LinkedIn free account, you can perform some powerful searches but your searches are limited in two ways. First, you can only see the full names of people in your searches if you are a first or second degree connection with them. For third degree connections, you can only see a user’s first name and last initial. Second, LinkedIn limits the number of results returned with each search to the most relevant 100 results. With a little knowledge and the X-Ray LinkedIn search technique, you can get around both of these limitations and significantly improve the width and depth of your search results. What’s the X-Ray Secret? There are two secrets to getting X-Ray LinkedIn searches to work. The first is to take advantage of the public profiles that LinkedIn makes available to Google and other search engines. The second trick is using some advanced features of Google Search, specifically searching within a web site and URL. Note that users on LinkedIn have the option to have their profile set to public or private. Not all users on LinkedIn have public profiles, but the vast majority of users do have a public profile. Note that this search includes several Boolean operators – the parentheses plus the AND , OR and parentheses operators. It is also important to use the “-dir” command because this excludes any directory listings or URLs with “dir” in them. The end result is that the search will only return results for individual profiles where either linkedin.com/pub or linkedin.com/in are present in the URL. Using the Boolean operators, you can string together multiple search phrases into a complete search query. Note that Google Search does not care about capitalization – but it is a good practice to capitalize your Boolean operators to make them easier to identify if you have to troubleshoot your query. If you use Boolean in LinkedIn, you have to use all CAPS so it is good to get in the habit of capitalizing your Boolean operators. When issuing a long query in Google Search, you can only see about 60 characters, so another tip is to write your query in the Notepad or Microsoft Word so you can easily see your whole query and then copy it into Google search. The query as listed above returns about 2,700 results. This compares to only 191 results when I use LinkedIn Advanced Search to issue a similar query. 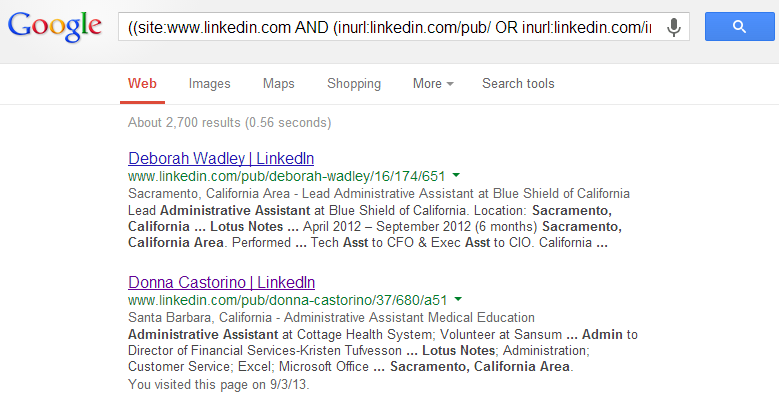 In addition, many of the LinkedIn results only provide a first name and last initial instead of a complete name. The primary difference is that the Google Search returns results from all of LinkedIn while the LinkedIn search is limited 1st, 2nd and 3rd degree connections. Another big difference is that the Google search returns results from anyone who ever had Sacramento (or surrounding geography) in their profile even if they have moved away. Just like LinkedIn, the Google search results provide some summary information from the user’s LinkedIn profile that you can easily browse and a clickable link that takes you to their LinkedIn public profile. Once in LinkedIn, you can then use your other super powers to reach out and connect with them. Becoming an X-Ray Search Expert will take some practice and you may have to experiment or tweak your search query several times before you get the results you want. One tip is to make sure you have a good starting point by copying and modifying one of the queries above. However, the outcome of doing more targeted search primer should give you plenty of ammunition to get started on leveraging LinkedIn to find those “needles in a haystack” that no one is seeing yet.